I’m always curious when I hear some say “Well, I’m getting old” or “It’s my age”. I wonder why we’ve ground that so tightly into our psyche. 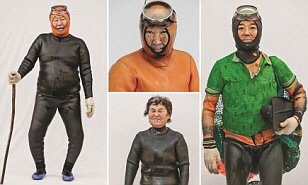 I don’t mean that in a judgemental way, I have no expectations that we should all be like those little old ladies, octogenarian no less, in Korea still diving in the sea and pulling out seafood for their lunch on a daily basis. But, y’know, it makes me curious as to where the belief comes. The idea of age and ageing is an interesting one. Is it a badge of honour? A delicate excuse? And actuality? I mean, yes, I know that each day we have been here 86,400 seconds longer, but almost all of the cells in our bodies renew every 28 days. That means that new are ‘new’ every four weeks. Bodies wear, they are physical units of mass and that mass has a habit of friction in against itself in our joints and tissues. Muscles knot and tighten, restrictions limit range of movement, as does deformity, lack of stability and an overwhelmed nervous system. Perhaps, diet, lifestyle and cultural norms have a huge impact on our body sense of ageing. Many a client has remarked that their Grandma’s walked miles a day and climbed the stairs well into their eighties, that they worked hard up to the end even if they smoked and drank. There are many things in our environment that are hard to control: Chemicals in our food and water system and the stress that comes from commuting and work are two examples- and even these we have great control in modifiying. But what about our physical bodies? Could we trust that with care and diligence we could not only maintain the levels of stamina, fitness, co-ordination and flexibility over the years but actually improve them? I would say that it is possible, especially if we stay focused on what is truly important. Love, movement, companionship, listening and being heard, positivity. If we listen not only to each other, but also to our bodies needs we have a clearer understanding of what our requirements truly are. More water? More time outside in the daylight- especially T this time of year? More rotational movement- not just forwards up and down but in all directions and planes? More time spent with people we cherish? More time spent laughing. And at the same time: Less time complaining? Less time obligation? Less expectation of decline? If you have any thoughts of your own on this or responses you’d like to share please comment below.